If you're just attaching to a queue go to the run a compute worker section. 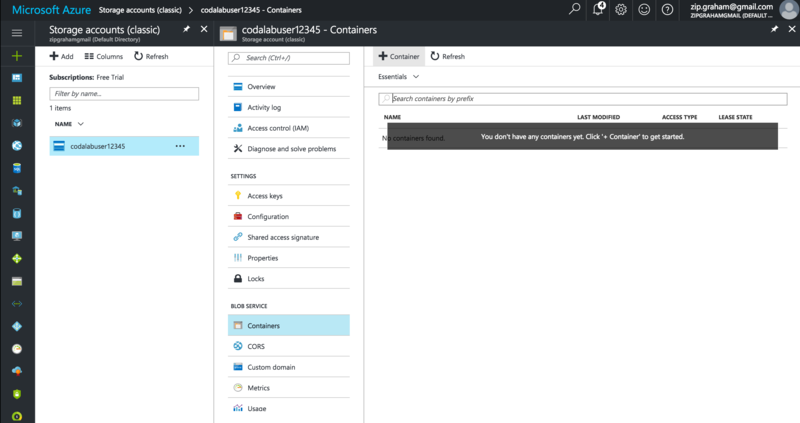 You'll need to create a storage container (AWS S3 or Azure) and configure a .env file which will store your settings like: storage keys, SSL certificate paths and ports that are open. NOTE: If you are upgrading from an older version of Codalab that doesn't use Docker, please make sure you remove your settings/local.py file! Install Docker CE (Community Edition) use the mac installer here, which is complete with docker-compose. Open .env in your preferred editor, you'll fill this in with your storage keys, SSL information, etc. Be sure to replace passwords/secrets! # Always set the secret key! Codalab gives you the option of using AWS or Azure as your storage of choice. Depending on vendor you use, you must comment out the one you are not using in the .env file. 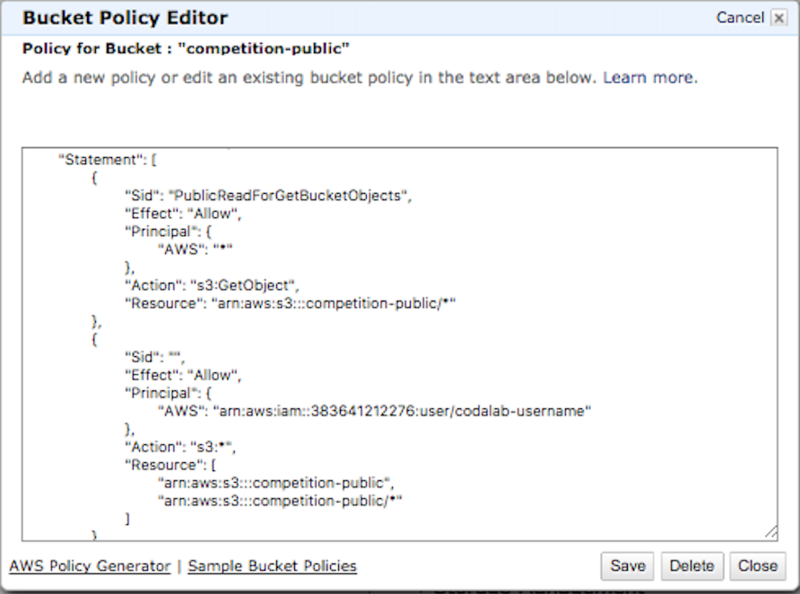 Sign in or create an AWS account here and then create a private and public bucket. You don't have to do this if you've already setup Azure Blob Storage! 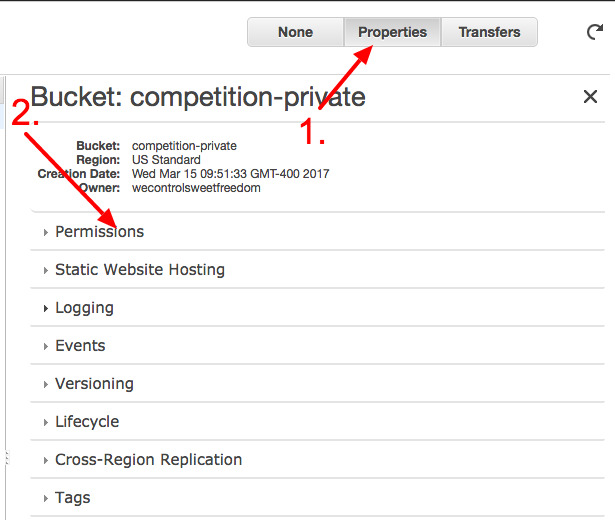 Create 2 buckets, one named "whatever-public" and another "whatever-private"
In the Region box, select US West 2. Make sure you have your bucket highlighted, click properties button, then click permissions tab. Now edit CORS. If you don't already have a user (via Identity and Access Management -- IAM), you'll need to create that here and put those key/secret values into your .env under AWS_ACCESS_KEY_ID and AWS_SECRET_ACCESS_KEY. Your permissions don't need to be set. Continue to the next step. Copy your special AWS_ACCESS_KEY_ID and AWS_SECRET_ACCESS_KEY for this user. Copy your username, you'll need it for setting up Policies on your public and private buckets. 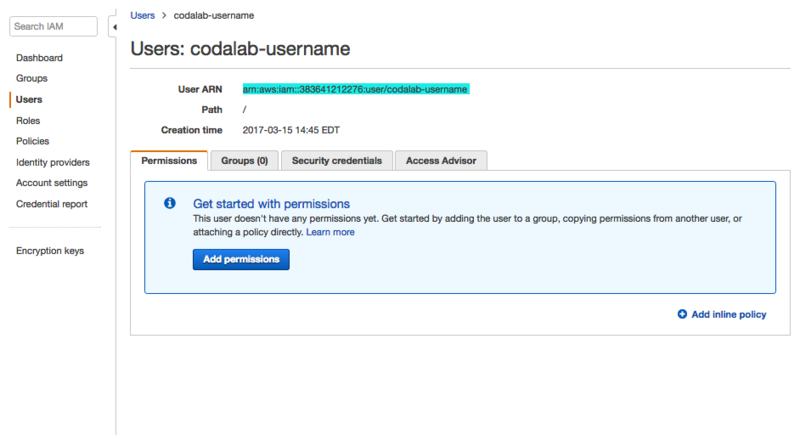 Use your AWS account email address and password to sign in to the AWS Management Console. If you previously signed in to the console with IAM user credentials, your browser might open your IAM user sign-in page. You can't use the IAM user sign-in page to sign in with your AWS account credentials. Instead, choose Sign-in using root account credentials to go to the AWS account sign-in page. In the top right of the console, choose your account name or number. Then choose My Security Credentials. If necessary, in the dialog box, choose Continue to Security Credentials. You can choose the box next to Don’t show me this message again to stop the dialog box from appearing in the future. Expand the Account Identifiers section to view your AWS account ID. Sign in to the AWS Management Console as a federated user. Select Support in the upper right corner of the console and choose Support Center.If necessary, in the dialog box, choose Continue to Security Credentials. You can choose the box next to Don’t show me this message again to stop the dialog box from appearing in the future. Your AWS account ID appears in the upper right. The account ID for an AWS account is the same for the root account and its IAM users. For more information, see Your AWS Account ID and Its Alias. The following policy will allow anyone to download this data, like competition logos. For more details on Bucket Policy syntax and structure, refer to this guide. You may sign up for an Azure account here, then follow the directions below. You do not have to do this if you've already setup S3! From the Dashboard, click Storage accounts on the left. Click Add at the top of the page to create a new storage account. If you don't already have a subscription, create one now. The free trial requires a credit card, and deletes all your storage containers after 90 days, unless you upgrade to a different plan i.e. 'Pay as You Go'. Select the Classic storage account. Refer to the image below for settings. In the dashboard, click All Resources/All Subscriptions and then click on your username. 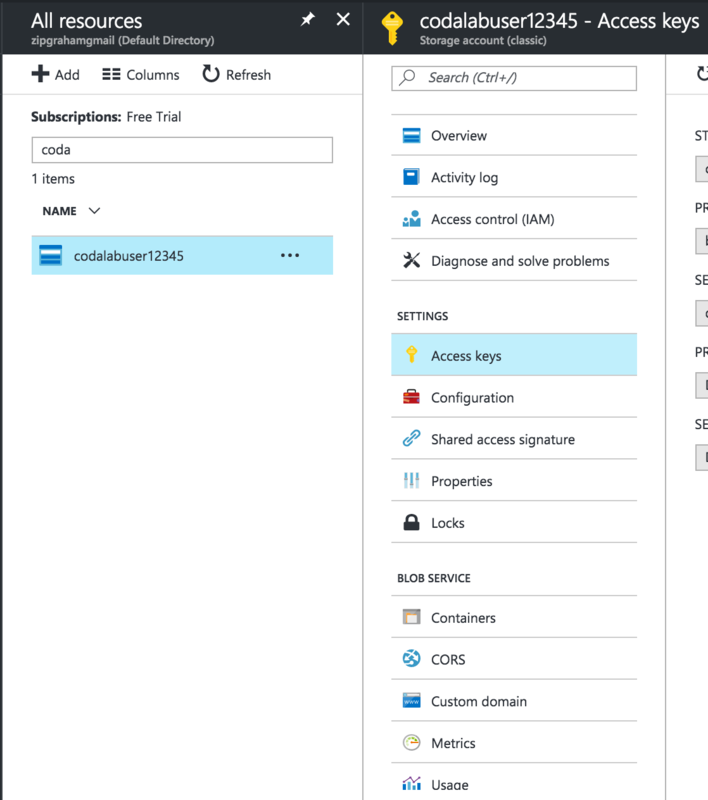 Click Access Keys and Copy your account name and access key to .env under AZURE_ACCOUNT_NAME and AZURE_ACCOUNT_KEY. 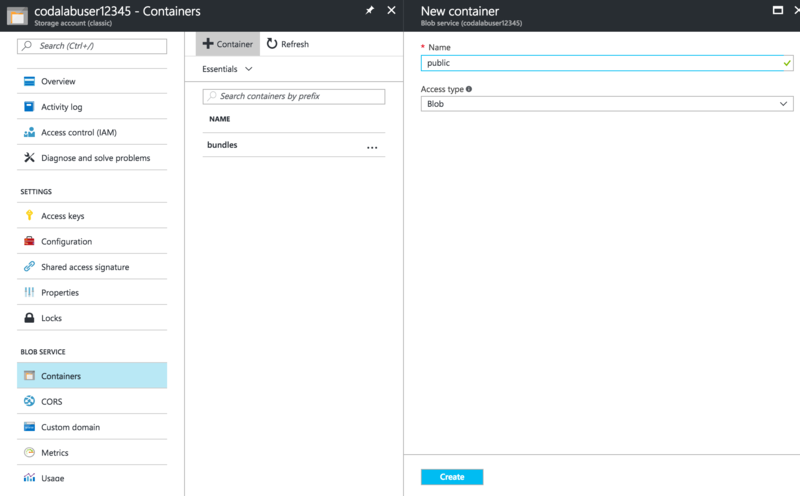 Within that same user account, click on Containers and Add a new container. Create a new container named "bundles". Set the Access to "Private". Add another container named "public". Set the Access to "Public Blob". Make sure your domain is set properly in your .env. If you are running locally, CODALAB_SITE_DOMAIN=localhost is fine. For our main website we use CODALAB_SITE_DOMAIN=codalab.org. Read here to auto-start docker when your OS boots. To change where logs are kept, modify LOG_DIR in your .env configuration file. Make sure you have ports 80 and 443 open on the machine.